I talk to quite a few individual inventors who are trying to understand where they should go with an idea they have. There is a common theme that the conversation turns to, so I thought I’d wrap up a few of the most important things here in this post. I love working with inventors because I love exploring new ideas. I also hate seeing people dump thousands of their hard earned dollars down the drain. I will only work with people once they have at least listened to me discourage them for a bit. 1 – Ideas Are Easy. Execution is Hard. This is the most important things you need to understand. You’d be surprised how often I’ve heard the phrase “world changing idea”. Unfortunately, ideas never change the world. People going out and getting things done change the world. Ideas never stand on their own and your idea is no exception. Focus on the execution. There are hundreds of great articles I could link to. Go do a Google Search on the topic and you’ll find a bunch of great resources. The graphic above is fantastic and is spot on (lifted from a post over at socialinnovationmn.com). Ideas are essentially commodity items. Give me and some of my creative buddies one hour and a white board and we’ll have a bunch of ideas spanning the spectrum from awful to good. What’s that worth? Absolutely nothing. It’s hard to find really reliable statistics, but the failure rate is staggering. In general, 99.9% of ideas never become commercially viable products. I’m not just saying that because it sounds bad either. To read through a bunch of quotes regarding success rates, check out this link. In fact, the idea or product itself has little to do with it.Like the graphic above shows, a week idea + brilliant execution is far more valuable than a brilliant idea that is executed weakly. I’m not a patent agent or patent attorney and I do not give advice on the patentability of particular idea. I do have a graduate degree in business and believe that above all else, individual inventors with limited capital must be very selective regarding how they allocate those limited resources. The cost for a patent will vary significantly. An independent agent may secure you a patent for as little as $4,000, but those costs can easily rise to $20,000 or more. There are some strategic things you can do here to limit the initial investment (such as writing a provisional patent application yourself), but the opportunity costs of where else you could spend that money should be evaluated. You can reasonably launch a small company selling a simple product online for less than the patent might cost to prosecute. It could be 3 years before you even find out if you have been rejected or a patent has been granted. Don’t consume yourself with fears of having your idea copied or ripped off. This is an irrational concern in most cases (good read on the topic here). Once you internalize point number 1 above, this will make more sense. 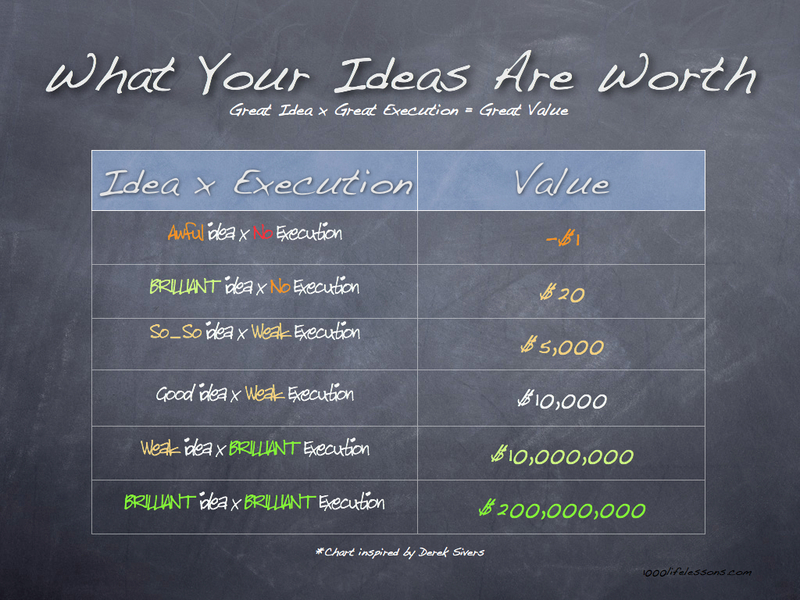 The value from your idea comes from the execution. A patent on a brilliant idea is still worthless unless someone goes out and actually does the hard part of executing. Maybe it makes sense to spend that capital on developing the product, getting it up for sale, and marketing it. If you’re successful, now you have an audience to launch your next project at and hopefully more capital for the next go around. On the other hand, if your ultimate path is to sell or license your invention, or convince investors to bring capital to the table, patent protection may be an integral part of the strategy to get there. What I want people to realize is that the patent protection is just one part of a large equation. We’ve already touched on the costs to pursue a patent. Product development costs will vary wildly based on the complexity of your project and how well the development is managed. If you have a great deal of capital and a complex product, I recommend heading straight to full service firm. This is what big companies do when they don’t have all the resources in house. For most individual inventors, investing tens or hundreds of thousands of dollars up front is often not an option. Pursuing a level-of-effort beyond the capital you have to support that effort a sure fire recipe for failure. The good news is that it’s getting easier. The web make is much easier to outsource activities, educate yourself and become an expert, and use the crowd to launch your product. 5 – Are you an Inventor, or an Entrepreneur? This is a great question and I recommend you read this short blog post over at the Harvard Business Review. Succeeding as either is challenging, but it’s important you understand who you are as you choose a path. If you’re not an entrpreneur at heart, it’s doubtful you’re going to be successful bringing an idea to market and launching a company alongside the product. Ok, so I should just give up on my dream? If all you have is a dream then yes, it’s time to move on. If you’d like to convert that dream to an action plan, then you can consider moving forward. The web is an amazing resource of free advice. Educate yourself. Understand the challenges you are going to face and put some kind of plan in place. Determine how much you can afford to invest and establish some milestones you must reach in order to keep pursuing the idea. You must move on from being an “idea person” to becoming someone that focuses and gets things done. Thanks for reading this post! Feel free to contact me or schedule a consultation if you feel I might be able to help you in some way.